Nancy wants to hold drug companies accountable. Pharmaceutical company price-gouging affects thousands of Oregonians. Patients in Oregon and the U.S. pay more for prescription drugs than anywhere in the world. Prescription drug prices start with the prices set by the drug companies. The pharmaceutical industry plays an aggressive game of “Not Us” when it comes to drug pricing but the truth is if they didn’t set prices so high, we would all be paying less. Until we do something to lower the prices drug companies are charging us, prices are going to continue to skyrocket. I am a former ER nurse and educator living on a fixed income. I have a chronic heart condition, severe osteoarthritis and crippling allergies. I have to take about 23 different medications every day. Having previous experience in the health care industry, seeing the price gouging by pharmaceutical companies is infuriating. There are occasions where I have to prioritize medications and stop taking others, often times worsening my health. I have skipped refilling a prescription for one of my inhalers because at $125, I cannot afford it. When I recently sent a list of my prescriptions to a friend in Canada just to compare costs, I was shocked by the difference in price. She reported that 17 of my prescribed drugs, for which I pay $236 out of pocket here, cost only $19 combined in Canada. A prescribed topical anti-inflammatory that would cost me $178 after insurance here is sold for just $10 over the counter there. My $125 inhaler is only $4 in Canada. It’s just not right. Fifteen of them were manufactured here in the United States, but I pay more than Canadians. My story is one that is too familiar for many and it’s unacceptable. You shouldn’t have to miss taking your medications because they are unaffordable. It’s time for pharmaceutical companies to be held accountable. I pay 31 times more than I would in Canada for my inhaler. I pay 12 times more for all my medications combined. I think drug companies should have to report when they want to raise drug prices by a certain amount and I want to know why my medications cost more than they do in other countries. That’s why I support HB 4005, the Oregon Prescription Drug Price Transparency Act. Pharmaceutical company price-gouging can be stopped. Join us! 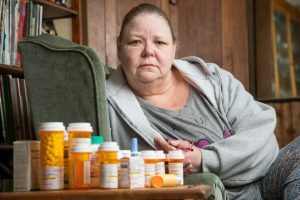 Join Nancy in holding pharmaceutical companies accountable for price-gouging: take action today! Together we can lower prescription drug prices for Oregonians.